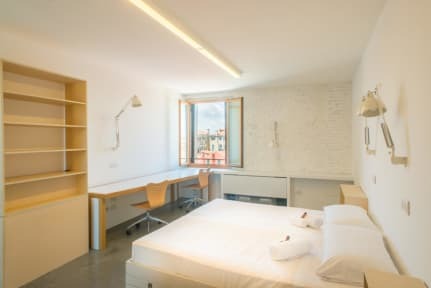 We_Crociferi, housed in a recently renovated 12th-century former convent, is just a stone’s throw from the Fondamenta Nove water bus stop in a neighbourhood oozing with authentic charm. The hostel offers beds in modern, functional rooms with en-suite bathrooms and air-conditioning. Some rooms also have a small kitchen and living areas. Guests have access to extensive communal areas including two cloisters, a laundry, a library and a study room. 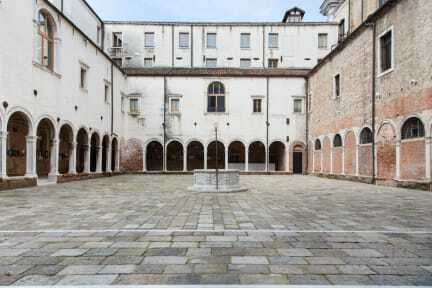 Breakfast, lunch and drinks are served at the Caffè ai Crociferi, in the ex-convent's atmospheric cloister. The reception is open 24/7 and our young, multilingual staff will be happy to tell you all about which events are going on and how to escape the busiest routes. Wi-Fi is available in communal areas. We also offer a free left-luggage service when you check in and check out. A breakfast of select local products (€7) is available from 7:30 to 10:00 am. The hostel is in the Cannaregio district, a 25-minute walk from Venezia Santa Lucia station and 15 minutes from St Mark's Square. It is just around the corner from the city’s nightlife district. Venice’s old town is fully pedestrianised. Bicycles and other cycles are strictly forbidden, even if they are not being ridden. Payment is due when you check-in. We accept cash, credit card or debit card (we may require pre-authorisation on your card prior to your arrival). Tourist tax is not included (€2 per person per night, €1 for children aged 10 to 15, free for under-9s).